From the Parade in Fashion collection, personalize your name in gleaming 18K gold and brilliant white diamonds, suspended from a fine link chain. Diamond Info: 31-RD 0.10 CTS Length: 18 inches, adjustable. Diamonds and Price may vary. Diamond earrings with Morganite. 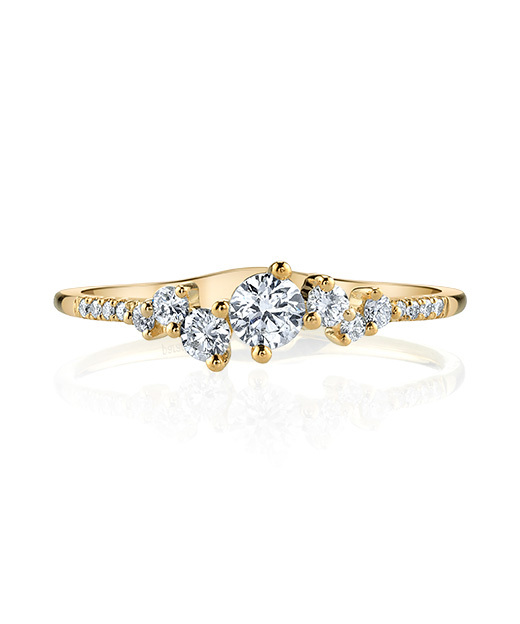 Diamond Info: 76-RD 0.49, 02-MOR 6.30 CTS Fits center stone size PR: 19x6 MM Price may vary depending on center stones. An exquisite 24.62 carat oval Morganite sits in a split band of glowing high polished 18K rose gold, in this contemporary stunner from the Parade in Color collection. Diamond Info: 02-RD 0.09, 01-MOR 24.62 CTS Fits center stone size OV: 22x16 MM GUIDE Price may vary depending on center stone. A stunning 46.32 carats of glowing Morganite is suspended from ribbons of sparkling white diamonds set in gleaming 18K white and rose gold. Diamond Info: 35-RD 0.54, 01-MOR 46.32 CTS Fits center stone size PR: 42x17 MM GUIDE Price may vary depending on center stone. A sprinkling of brilliant white diamonds complement a vivid oval Ruby in this delicate and classic band from the Parade in Color collection. Diamond Info: 26-RD 0.21, 01-RU 0.51 CTS Fits center stone size OV: 6x4 MM GUIDE Price may vary depending on center stone. A spectacular 21.29 carat cabochon Green Tourmaline rests atop sparkling white diamonds set in gleaming 18K white and yellow gold in this one of a kind statement ring from the Parade in Color Collection. Diamond Info: 72-RD 0.45, 01-TML 21.29 CTS Fits center stone size CU: 18x15 MM GUIDE Price may vary depending on center stone. A glowing pear shaped Morganite is suspended within halos of sparkling white diamonds and gleaming high polished white and rose gold in this stunning pendant from the Parade in Color Collection. Diamond Info: 23-RD 0.28, 01-MOR 7.88 CTS Fits center stone size PR: 20x10 MM GUIDE Price may vary depending on center stone. Milgrain etched scrolls curl and climb toward an intense oval-cut Morganite. Delicate in design but substantial in size, the 18K rose gold filigree sparkles with white diamonds. Diamond Info: 93-RD 0.47, 01-MOR 24.36 CTS Fits center stone size OV: 21x15 MM GUIDE Price may vary depending on center stone. 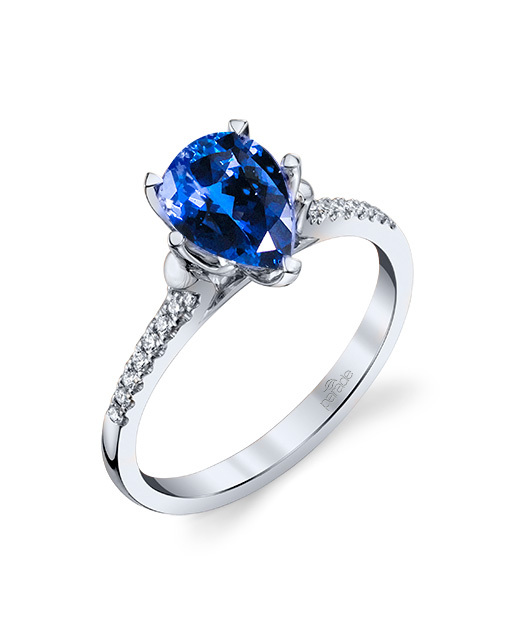 A stunning 6.28 carat cushion shaped Blue Sapphire is surrounded by 2.92 carats of gleaming white diamonds in assorted shapes and sizes, in this one of a kind statement ring from the Parade in Color collection. Diamond Info: 01-SA 6.28, 80-RD 0.55, 08-PD 1.54, 04-MQ 0.83 CTS Fits center stone size CU: 10x10 MM GUIDE Price may vary depending on center stone. A vivid canary yellow sapphire (2.21 ct) is showcased in an artistic diamond halo, atop yellow sapphires and 18K yellow gold twisted bands. Diamond Info: 36-RD 0.18, 56-YS 0.45, 01-YS(H) 2.21 CTS Fits center stone size EM: 9x6 MM GUIDE Prices may vary depending on center stone. A fancy cognac colored marquise diamond glows in a white diamond halo, complemented with fancy diamond scrolls in 18K black gold. Diamond Info: 77-FD 0.44, 26-RD 0.18, 01-MQ(N) 1.64 CTS Fits center stone size MQ: 12x6 MM GUIDE Prices may vary depending on center stone. A 6.77 carat vivid blue zircon sparkles in a diamond halo set above a gallery of diamond curls and scrolls in 18K gold. Diamond Info: 134-RD 0.75, 01-BZ 6.77 CTS Fits center stone size OV: 10x9 MM GUIDE Prices may vary depending on center stone. A pear shaped fancy pink diamond is enveloped in a delicate sweeping diamond halo, completed with curving diamond accents in 18K gold. Diamond Info: 47-RD 0.28, 01-PD(N) 1.00 CTS Fits center stone size PR: 7x5 MM GUIDE Prices may vary depending on center stone. Delicate diamond scrolls in 18K white and rose gold sparkle around a luminous 24.88 carat pear shaped Morganite. Diamond Info: 112-RD 0.41, 01-MOR 24.88 CTS Fits center stone size: SIZES MAY VARY Prices may vary depending on center stone. A breathtaking 11.60 carat pear shaped opal glows with spectacular play of color in a diamond and 18K rose gold halo, suspended by a delicate rose gold chain with scrolling diamond details. Diamond Info: 100-RD 0.53, 02-RCD 0.10, 01-OP 11.60 CTS Fits center stone size: SIZES MAY VARY Prices may vary depending on center stone. Pear shaped cabochon rubies glow in ruby halos, shimmering below scrolling diamond leaf accents, set in gleaming 18K gold. Diamond Info: 38-RD 0.19, 30-RU 0.49, 02-RU 4.72 CTS Fits center stone size: SIZES MAY VARY Prices may vary depending on center stone. Pear shaped fancy colored diamonds shimmer in fancy and white diamond halos suspended from curves and leaves of diamond set gold. Diamond Info: 36-RD 0.16, 30-FD 0.19, 02-PR 1.74 CTS Fits center stone size: SIZES MAY VARY Prices may vary depending on center stone. A fancy yellow pear shaped diamond sparkles within a double halo of fancy pink and fiery white diamonds set in 18K rose gold. Diamond Info: 12-RD 0.12, 12-PINK DIA 0.67, 01-YD 2.22 CTS Fits center stone size PR: 9x7 MM GUIDE Price may vary depending on center stone. Diamond-sprinkled leaves and vines, with pink sapphire flowers, showcase a stunning 11.53 carat rubellite tourmaline. Diamond Info: 144-RD 1.07, 67-PS 0.59, 01-PT(H) 11.53 CTS Fits center stone size: SIZES MAY VARY GUIDE Prices may vary depending on center stone. JCK Platinum Innovation Award Winner: Buyer's Choice 2014; also featured in Vogue Gioiello! Meandering diamond-set vines and leaves showcase a watery blue 7.03 carat Paraiba tourmaline. Diamond Info: 58-RD 0.51, 06-MQ 0.77, 01-TML 7.03 CTS Fits center stone size OV: 14 x 9.5 MM GUIDE Prices may vary depending on center stone. Scrolling diamonds set in 18K rose gold present a vivid 9.90 carat emerald-cut green tourmaline. Diamond Info: 208-RD 1.02, 01-GT(H) 9.90 CTS Fits center stone size EM: 15 X 10 MM GUIDE Price may vary depending on center stone. This stunning diamond necklace from the Parade in Color collection features a brilliant 6.14 carat pear shaped blue sapphire. Diamond Info: 34-PCD 1.62, 28-RD 0.18, 01-SA(H) 6.14 CTS Fits center stone size PR: 14x9 MM GUIDE Price may vary depending on center stone. This phenomenal 14.88 carat cat's eye Alexandrite set in a basket of yellow gold is encircled by a setting of white gold and white diamonds finished with an exquisite crown of fancy colored yellow diamonds. Diamond Info: 07-YD 1.19, 94-RD 0.45, 01-ALX 14.88 CTS Fits center stone size OV: 15x13 MM GUIDE Price may vary depending on center stone. Pretty in pink! Milgrain-etched braiding set with 676 white diamonds dance around 20.64 carats of bright pink tourmalines. Diamond Info: 676-RD 4.88, 07-PT(H) 20.64 CTS Fits center stone size OV: 14x10 & 10x8 MM GUIDE Price may vary depending on colored stones. A necklace fit for royals, seven oval blue sapphires totaling 17.96 carats sparkle among 7.53 carats of diamonds! Diamond Info: 07-SA(H) 17.96, 43-RD 5.03, 09-PD 1.16, 18-MQ 1.34 CTS Price may vary depending on colored stones.